UPDATE: The Spring 2010 issue of the Concordia Journal hit the mail on Thursday, May 20. Check your mailboxes soon! The Spring 2010 issue of the Concordia Journal is at the press. It should be in our subscribers’ hands in a couple weeks. In the meantime, you can find the Homiletical Helps right here at ConcordiaTheology.org. Here’s a couple excerpts to whet your appetites. One Sunday last February Diane and I got into a short but stimulating conversation as we drove home from church. Our pastor had announced a community-wide evangelism effort and invited members to go door-to-door and pass out invitations to come to church. Diane asked, “Why would someone sit in church for an hour when that’s not how we live anymore? Short bursts of information; that’s how we live.” Then she held up her Blackberry and said, “People today think they have everything they need right here.” She went on to give examples. Today you don’t need a newspaper, old-style books, land-lines, or TV. Just about everything you need can be in the palm of your hand. Actually go to church? Many of us were raised in an era when going to church was accepted in American society, even encouraged by Sunday blue laws. In some ways, church-going is like the hardcopy of the newspaper. When I asked her if we should get the New York Times on the Kindle, she said, “No, I like the feel of holding the paper.” Going to church feels right to many of us but it doesn’t make sense to more and more Americans…. So, bye-bye institutional church! What in God’s name can we do? Our best historic vigor has come from centering our personal, congregational and synodical existence on study of God’s Word and the obedience of faith. “Thy word is truth” (John 17:17). Now comes postmodernism, with its “disillusionment with the idea of absolute knowledge,” decapitating the intellectual side of spiritual life across the religious landscape. Our synodical future? Probably not too promising if we come across to spiritual shoppers as cerebral and cocksure about it. Teaching the class on postmodernism challenged many of my own assumptions about faith and ministry. Interesting thing, though. Whenever I, a 60-something, lamented this new context, the 20-something students in my class pushed back and pointed to the great possibilities that postmodernism presents. They are positive about their future ministries and well they should be. Questions and disagreements about the Scriptures have affected the Lutheran church from the beginning. The Reformation made sola Scriptura an enduring slogan, and the slogan reflects one side of an ongoing division over authority in the church. The Enlightenment went further, putting question marks over the authority of the church’s Scriptures, doctrine, and hierarchy. These developments provoked another division among those who call themselves “Christians.” In the twentieth century, questions about the New Testament canon and its formation arose. They anticipated the questions about the origins of the Chuch and the concept of being “Christian” associated today with “Gnostic gospels” and The DaVinci Code. What follows are three specially selected “classic” articles from well-known authors in our Lutheran circles. 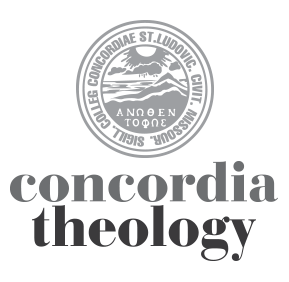 There will be a fourth “classic” article reprinted here at ConcordiaTheology.org. I won’t mention their names to leave you in suspense, but I will say that the questions they raise cover the full spectrum, and they have no easy answers. It is all part of initiating a conversation that will continue toward Concordia Seminary’s Fall 2010 Theological Symposium, “Scripture and the Church: Formative or Formality?” (September 21-22). Expect to see and hear a lot more here and elsewhere.